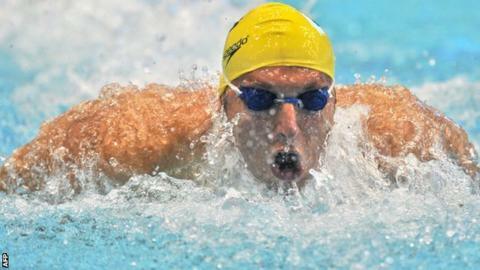 Former Olympic swimmer David Davies says depression is an all too common issue for many retired athletes. Five-time Olympic champion Ian Thorpe, 31, is being treated in a Sydney hospital after undergoing several operations in recent months. Thorpe was treated for depression this year and Davies - now lifestyle adviser to athletes - says the problem is common among elite athletes. "It's sad to see and I know it's an issue within sport now," Davies said. Thorpe made his Olympic Games debut in Sydney in 2000, winning three golds before securing another two in Athens 2004. He retired in 2006 because of a lack of motivation but made a comeback in 2011 only to fail to make the Australian team for the London 2012 Olympics. In his autobiography, published last year, Thorpe revealed he had been battling "crippling depression". Welshman Davies, 29, is an Olympic silver and bronze medallist and competed at international events at the same time as Thorpe before retiring following London 2012. He now works part-time for the Sport Wales organisation as a performance and lifestyle advisor, and one of his roles is to help athletes from all sports when they are approaching retirement or have issues such as depression. "It's a common trend in sport now that people struggle to deal with retirement and they don't really find another passion in life," Davies told BBC Wales Sport. "We've seen it in a few different sports and people do sadly take to depression through alcohol or whatever sort of things. "Hopefully this can be a bit of a wake up for all sports and we can really look after the athletes who do eventually retire. "Governing bodies and organisations are looking at how athletes can best make a smooth transition back into the real world. "Because you can't ever relive those highs of winning Olympic medals, Olympic golds and he [Thorpe] won many Olympic golds and broke many world records. "It is difficult because you are in such a bubble. It's never ending and you're always focused on your goal and the massive highs of when you do get success. "You are kind of living a different life to the normal person on the street. "I guess getting a standard 9 to 5 job is never going to give you those sort of thrills. "For me I was ready to stop, which I think is an important thing. I knew that I had given everything I had for many years and I was ready to move on to something else. "I found new passions and can look back on my career with quite fond memories."